U. S. Civil War Photographs - Spotsylvania C. H.
Spotsylvania C. H. Vicinity, May 19, 1864. After the Wilderness, Grant's and Meade's advance on Richmond by the left flank was stalled at Spotsylvania Court House on May 8. This two-week battle was a series of combats along the Spotsylvania front. 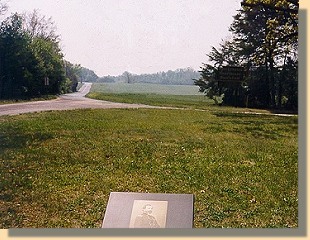 Spotsylvania Battlefield - May 10, 1864. 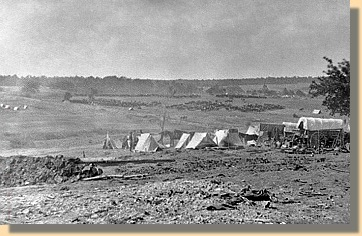 The Union attack against the Bloody Angle at dawn, May 12-13, captured nearly a division of Lee's army and came near to cutting the Confederate army in half. Confederate counterattacks plugged the gap, and fighting continued unabated for nearly 20 hours in what may well have been the most ferociously sustained combat of the Civil War. On May 19, a Confederate attempt to turn the Union right flank at Harris Farm was beaten back with severe casualties. 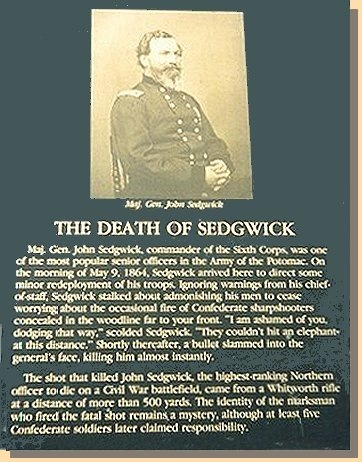 Union generals Sedgwick (VI Corps commander) and Rice were killed. Confederate generals Johnson and Steuart were captured, Daniel and Perrin mortally wounded. On May 21, Grant disengaged and continued his advance on Richmond. 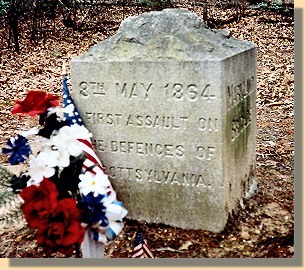 Sedgewick's position when he was killed. 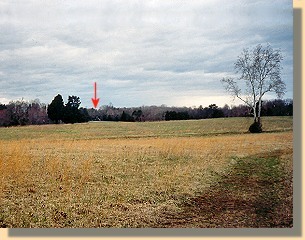 The Confederate line was near the trees in the far distance (Laurel Hill). View from the Confederate Line (Laurel Hill). Sedgewick's position is directly below the red arrow. 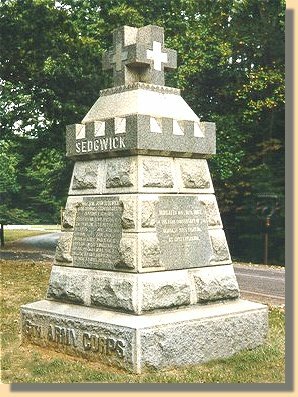 Spot where General Sedgwick was killed. Drawing by Alfred Rudolph Waud, ca. May 9, 1864.